Originally Intel intended to offer microcode updates for all CPUs that are up to 5 years old to close the meltdown/spectre 2 vulnerability. At least that was my understanding. 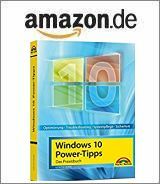 German blog reader Stefan P. pointed out to me that Intel has changed its mind. 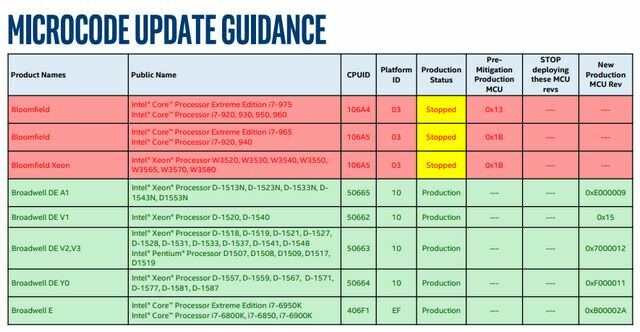 If you look at the Intel PDF document Microcode Update Guidance dated March 6, 2018, you will not only find a list of CPUs for which microcode updates have been released. There are mentioned also more microcode update planned for near future. I’ve addressed this within my blog post Intel Spectre/Meltdown Microcode Updates (March 11, 2018). A new revision of the Microcode Update Guidance from April 2, 2018, be available as a PDF document, changes some things. Browsing through the pages of this PDF document, shows entries like the ones shown below . Intel has stopped the development of microcode updates because the microarchitecture prevents the development of patches, the CPUs have ‘little practical significance’ or because customers use the CPUs in closed systems and do not expect any attacks there. 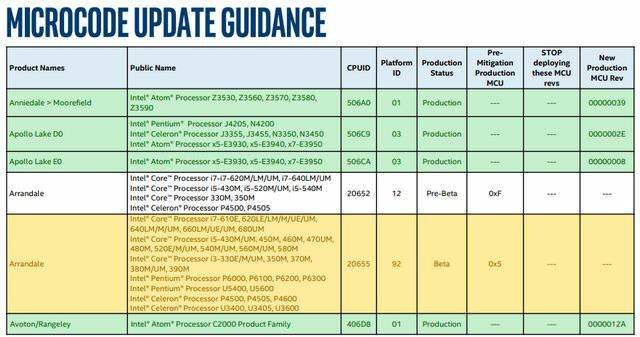 This entry was posted in computer, devices, Update and tagged CPU, Intel, Meltdown, Spectre 2. Bookmark the permalink.